Thanks to our Purchasing Coordinator and part-time knitwear designer, Emma Welford for this week’s tip! If you hate purling and dread seaming or just want to challenge yourself with a different construction, try converting your flat pattern to knitting in the round! I’m currently doing this with my Holla Back Tank pattern since I’ve already knit the pattern once and want to keep myself on my toes this time around. – Read through your pattern carefully before beginning. If it has unusual construction techniques or a lace pattern with special stitches on every row, it will be more complicated or even unsuitable to translating to working in the round. This depends on your skill level and comfort with the contents of the pattern so only you can make that decision. – Knit your gauge swatch in the round. Like a lot of people, I find I knit slightly tighter in the round than I do flat. – Remove any selvage stitches when calculating how many stitches to cast on and where any shaping takes place.For example, if the front of your sweater says to CO 102 stitches (100 body stitches and 2 selvage stitches) and the back of your sweater says to CO 112 stitches (110 body stitches and 2 selvage stitches), you would CO 210 stitches when knitting in the round. – Remember that any WS rows will be worked opposite to what they originally state. 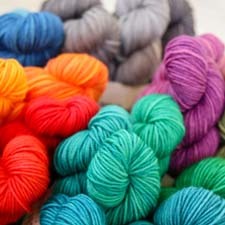 Purls will be knit, knits will be purled, and lace or cable patterns will be worked backwards. If you have a chart, read the WS rows from right to left. 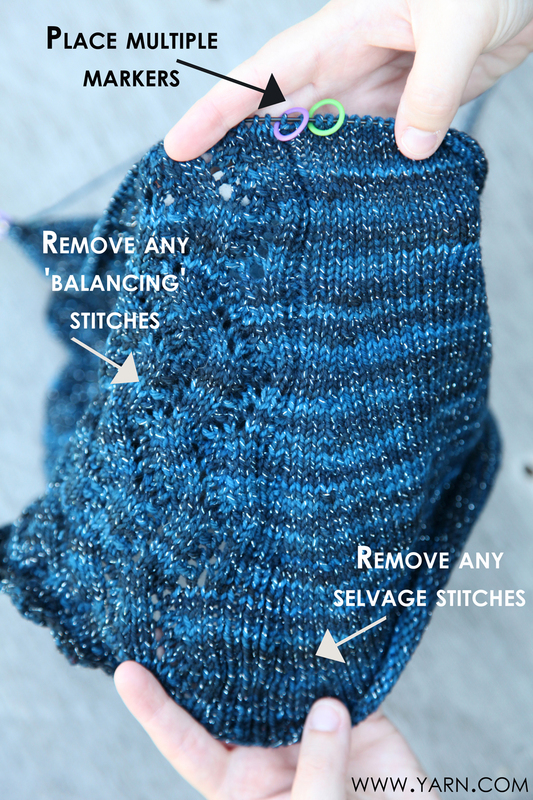 – Remove any ‘balancing’ stitches outside of the repeats for a lace or cable pattern. – Don’t be afraid to place multiple markers!I place one color to indicate the beginning of the round, and another to separate the front and the back of the sweater to help me remember to follow the different instructions for each piece. I also like to use stitch markers to separate out lace or cable panels. – If your pattern calls for sleeves, you could knit them flat and seam them as originally called for. Another option is to pick up stitches from the armhole and work a short row sleeve cap, then knit the sleeve downwards from there and reverse shaping by decreasing at the intervals where the pattern says to increase. Choose the method you’re most comfortable with! This entry was posted on Tuesday, September 18th, 2012 at 8:00 am	and is filed under Tips & Techniques. You can follow any responses to this entry through the RSS 2.0 feed. You can skip to the end and leave a response. Pinging is currently not allowed. You state that for charts, WS rows should be read left to right. This is true for knitting flat, but if you convert to knitting in the round all WS rows should be knit right to left just as though they were RS rows, shouldn’t they? Thanks for catching my typo, Ginni! You would think I know my right from my left by now by apparently not. 😉 Post is being edited, you are correct in stating all rows would be knit right to left. Anita, balancing stitches are stitches outside your repeat in a lace or cable pattern that ‘balance’ the design. For example, you might have a lace pattern that reads k2 *ssk, yo, k5, yo, rep from * until 2 sts from end of round, k2. You would remove the stitches outside the *’s and adjust your stitch count if needed. What are balancing stitches? And are they usually included and already written into a flat knitted pattern? …like selvage stitiches. Solina, another person asked the same question below, here is the response I gave her. Balancing stitches are stitches outside your repeat in a lace or cable pattern that ‘balance’ the design. For example, you might have a lace pattern that reads k2 *ssk, yo, k5, yo, rep from * until 2 sts from end of round, k2. You would remove the stitches outside the *’s and adjust your stitch count if needed. So yes, they are written into a flat knitted pattern but it depends on the pattern–a stockinette stitch pullover would likely not have balancing stitches, though ribbing is another common place to find them (ie *k2, p2; rep from * until 2 sts from end of round, k2.) Hope that clarifies! Knitting in the round, attaching the sleeves and working the rest up to the neck is likely your best course.